Hard to believe that Christmas and New Year’s Day have already come and gone! It seems like just a minute ago I was up to my elbows in sugar, flour and butter, baking cookies as holiday gifts for the family. I made dozens of cookies and managed to save a few of them for me. I’ve enjoyed them while taking morning or afternoon breaks and savoring the relative quiet during the last few days. These biscotti are especially good with a demitasse of espresso (the Italians are really onto something with this combination!) or mug of tea. I use the original recipe ripped from a Bon Appétit magazine a couple of years ago. The recipe is also on their site and I noticed they modified it at some point. Based on the comments, it appears many people thought the dough was too dry. I’ve never had issues with the original version, other than the occasional crumbling cookie corner which sometimes occurs when slicing the baked logs. However, I often use extra-large eggs so maybe that little bit of extra liquid makes a difference. And I use a Professional Kitchenaid mixer which has a great motor and it does work pretty hard to bring the dough together. So maybe the updated recipe will work better for most people. The recipe in this post is the original and the one I use, but the link above will take you to the new version, if you’d prefer to try it. A couple of notes: I use dried sour cherries, sometimes called pie cherries. 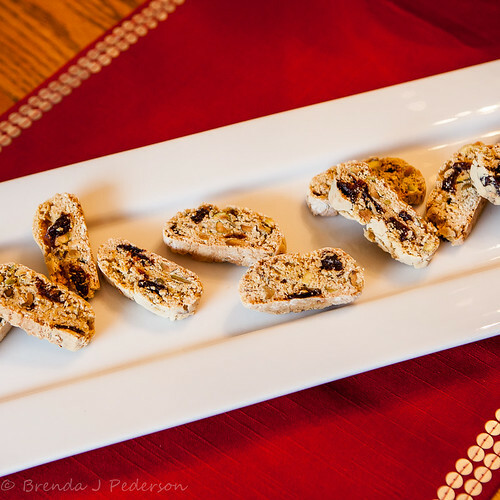 The first year I used dried Bing Cherries and didn’t care for them in this recipe. Also, if you look at the online recipe it says the cookies can be made three days in advance. That seems pretty limited. I’ve sometimes taken up to a month to finish them but keep them in an airtight container. Preheat oven to 350°. Line a large rimmed baking sheet with parchment paper or a silicone baking mat. Combine first 6 ingredients in the bowl of a stand mixer fitted with a paddle. Blend on low-speed for 30 seconds. Meanwhile, in a separate bowl, whisk together eggs and next 5 ingredients. Add egg mixture to flour mixture; beat on low-speed until combined, about 1 1/2 minutes. Fold in cherries and pistachios. Transfer dough to a lightly floured surface; divide in half. Using floured hands, shape each dough half into a 16″ long log. Brush off excess flour; transfer logs to prepared sheet, spaced 5″ apart. Flatten each log into a 2″-wide strip. Bake, rotating sheet halfway through, until browned and set, about 30 minutes. Transfer pan to a cooling rack; let cool for 15 minutes. Reduce oven to 250° and arrange 1 rack in top third of oven and 1 rack in bottom third. Line a second baking sheet with parchment paper or a silicone baking mat. Transfer biscotti to a work surface. Using a serrated knife, cut each strip diagonally into 1/3” thick slices. Arrange slices, cut side down, on baking sheets. Bake biscotti, rotating baking sheets halfway through, until crisp, about 40 minutes. Transfer baking sheets to racks; let cool.